Made in the U.S.A. Heavy duty virgin waterbed vinyl 20 mil. High quality replacement waterbed mattresses for wood sided waterbeds. Semi wave design. Select sizes from drop down menu. Price is the same on the Super Single, Queen and King size. 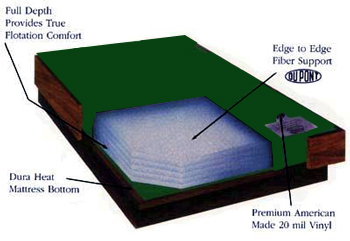 The Emerald 95% Waveless Waterbed Mattress is made in the U.S.A from heavy duty virgin waterbed vinyl 20 mil.